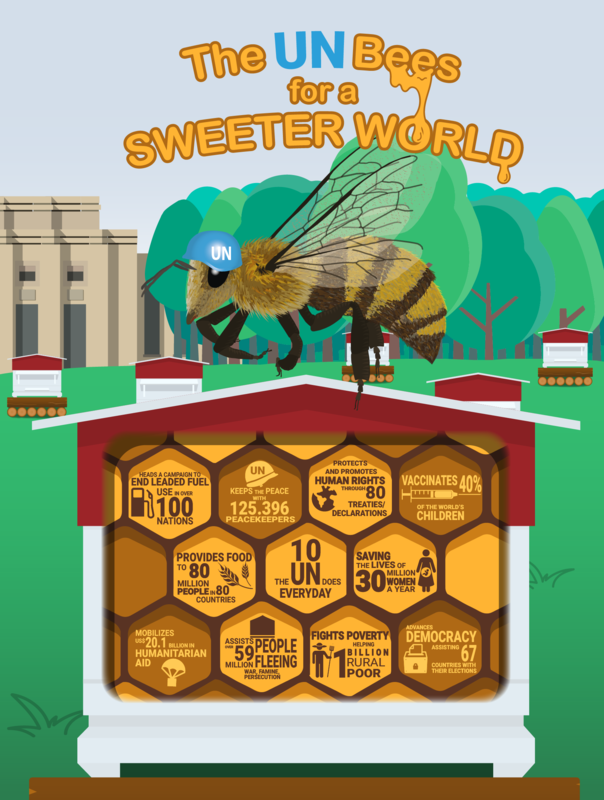 With the theme the honey bee, this is an infographic of 10 things the UN does everyday. It portrays the beehives at Ariana Park, Geneva. The 10 beehives were a gift from Switzerland on “15 September 2012 to mark the tenth anniversary of Switzerland’s accession to the United Nations”. The beehives produce honey and the UN sometimes uses it for gifts to guests. According to the Swiss government, this gift was in keeping “not only with the concerted efforts of the UN to conserve biodiversity but also with Switzerland’s own objectives on the field”. The hives are painted with the colors of Switzerland and with an inscription of a UN objective: Peace, Human Rights, Solidarity, Cooperation, etc.